Throwback Thursday: Remember When a Bluetooth Headset was a Must-Have Accessory? The Borg, Lt. Uhura, and security guys wore them. People talked to themselves in public. Once upon a time, Bluetooth headsets were all the rage, filling mall kiosks and Best Buy stores. There were curving behind-the-ear loops, chrome blobs, and sleek black sticks like Apple's. And it seemed that everyone who was anyone had a Bluetooth headset to accompany their new Blackberry … [Read more...] about Throwback Thursday: Remember When a Bluetooth Headset was a Must-Have Accessory? Can the iPhone Sync With Multiple Exchange Servers? 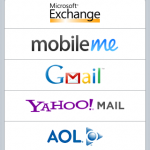 One of the major advances introduced in iPhone software version 2.0 was the ability to sync over-the-air to Microsoft Exchange servers using Microsoft's ActiveSync protocol. This was introduced to much fanfare with the iPhone 3G and is available on older updated iPhone and iPod Touch units, too. Google and NuevaSync also offer over-the-air calendar and contact syncing for the … [Read more...] about Can the iPhone Sync With Multiple Exchange Servers?